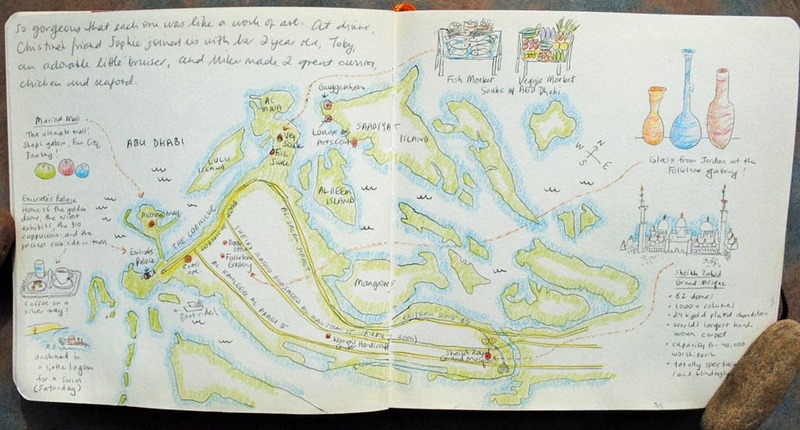 I’ve been keeping a travel sketchbook for twelve years now. 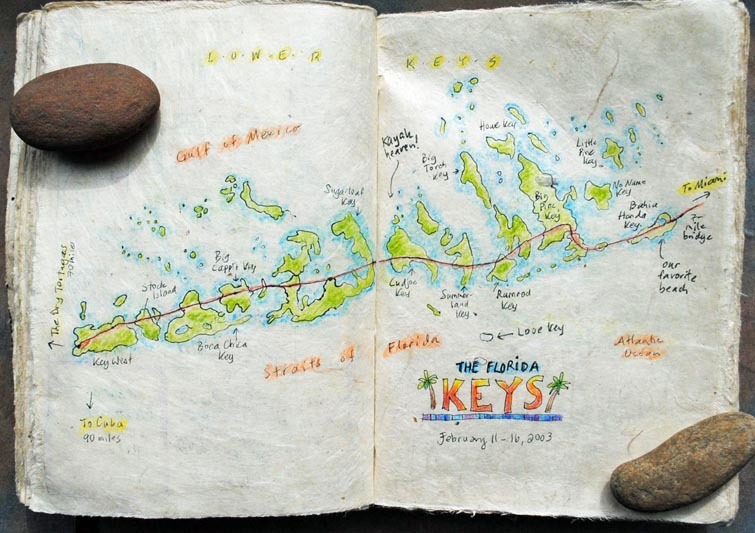 No matter where I go, one kind of drawing that makes it into almost every trip is a little map. 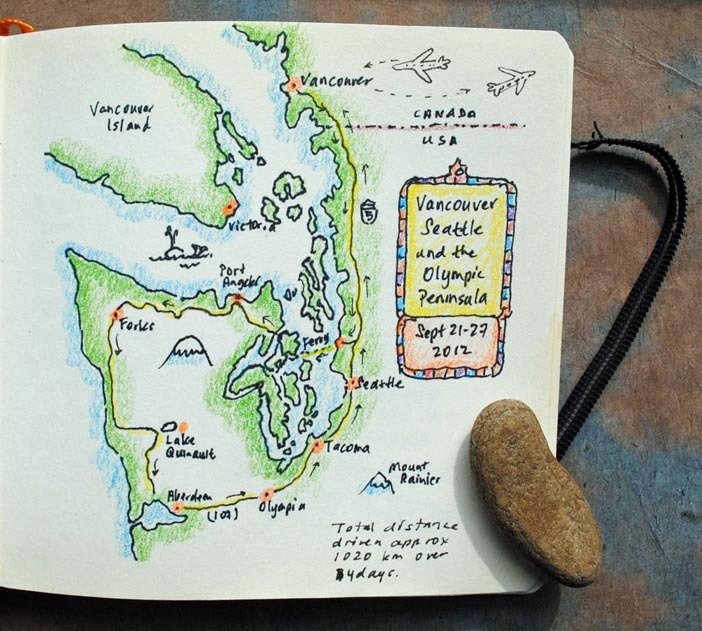 Drawing out excursions, whether made by foot, boat, train, car or plane, helps to remind me of the little moments that I might otherwise forget. It also helps me to understand the geography of where I’m traveling. 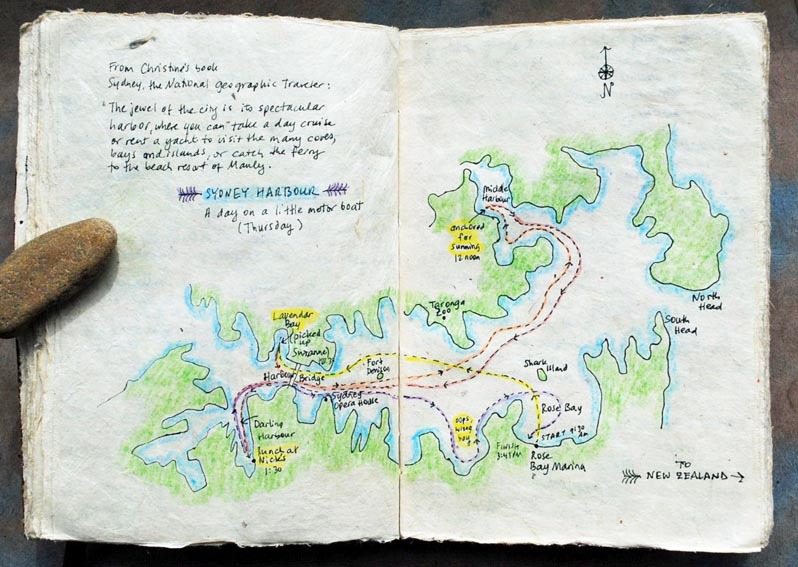 By looking at other maps to guide me as I draw, I learn more about the place I’m visiting. 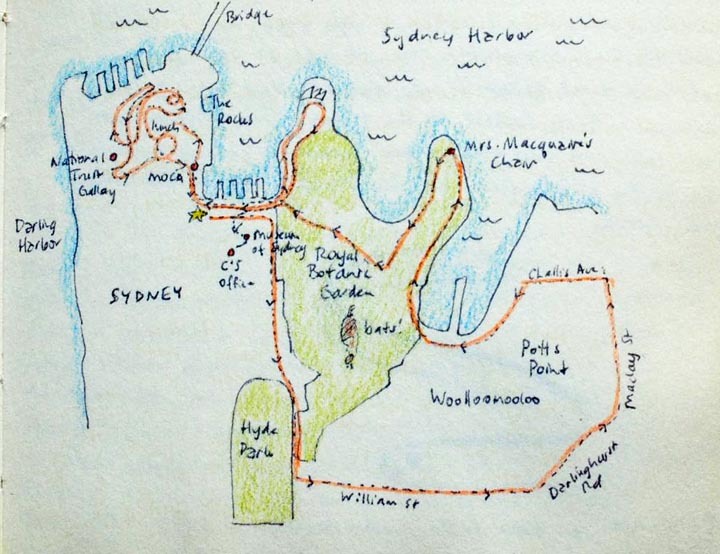 Here’s a little map of a walk I took in Sydney, Australia. Sometimes I’ll start off a trip with a global map to emphasize the distance traveled. 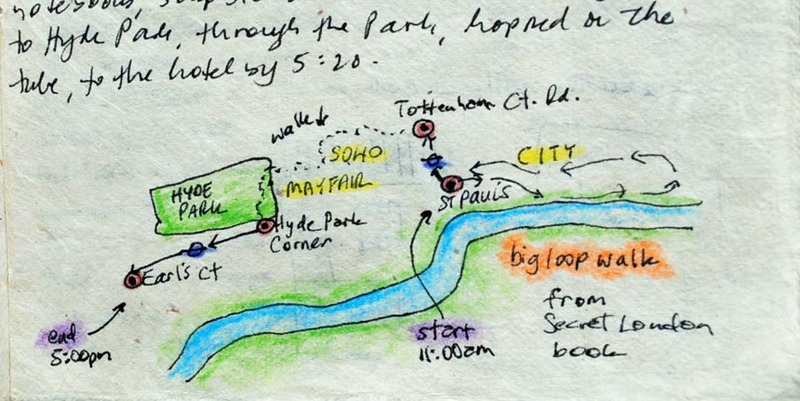 Or an overall view of the destination. or a particularly memorable day, which in this case was a day spent puttering around Sydney Harbor in a little motorboat. I draw with a black pen, filling in with Prismacolor pencils. I like Prismas because they’re waxy, they don’t bleed if they get wet, and the colors can be blended, so I need to bring only ten colors along. 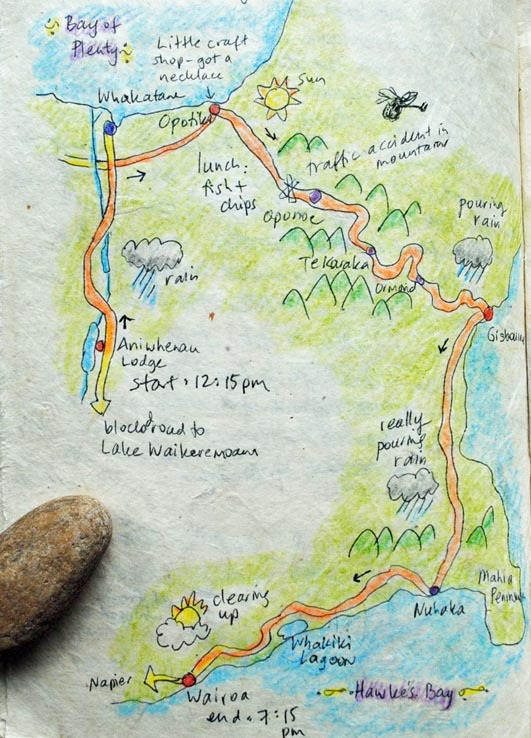 Sometimes I’ll draw the route of a long drive. This is on the North Island of New Zealand. 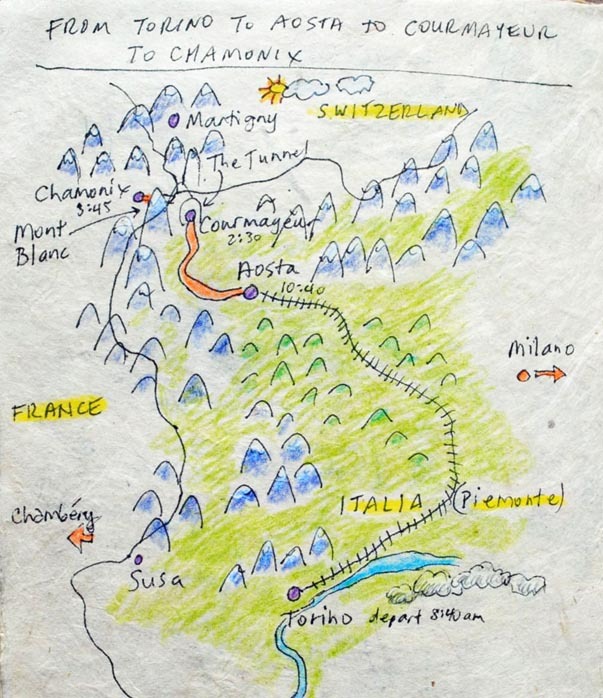 This was my path by train through Italy to the French Alps in 2004. 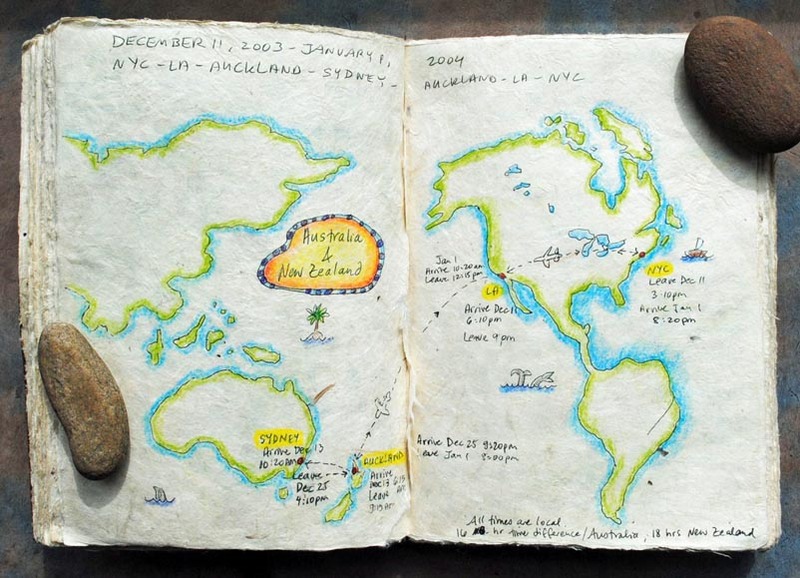 In 2006 it was off to Australia again. My sister lived there at the time, and this was my third visit. 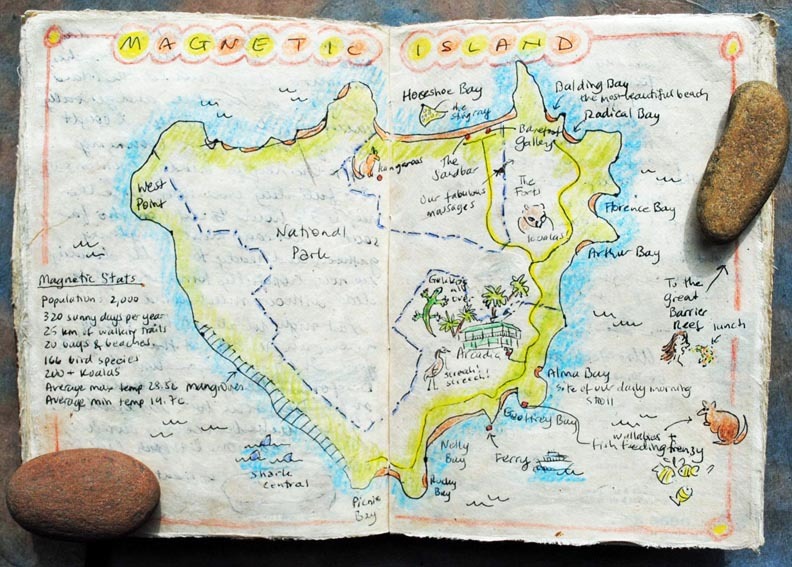 This is Magnetic Island, off the eastern coast of Australia, near Port Douglas. My sister and her husband owned a house there for a few years. Koala bears perched in the trees, Kookaburras visited us in the morning for their ground beef treats and a bird called the Bush Stone Curlew screamed all night long. Quite a memorable trip. 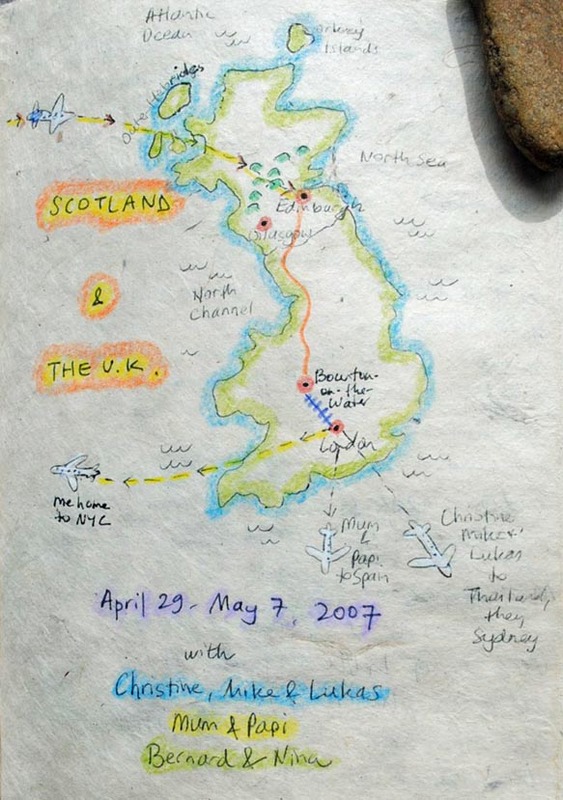 In 2007, we planned a family trip through Scotland and the UK. My black pen was on its last legs. 2007 was a fun year. In the fall, I went to Australia again. 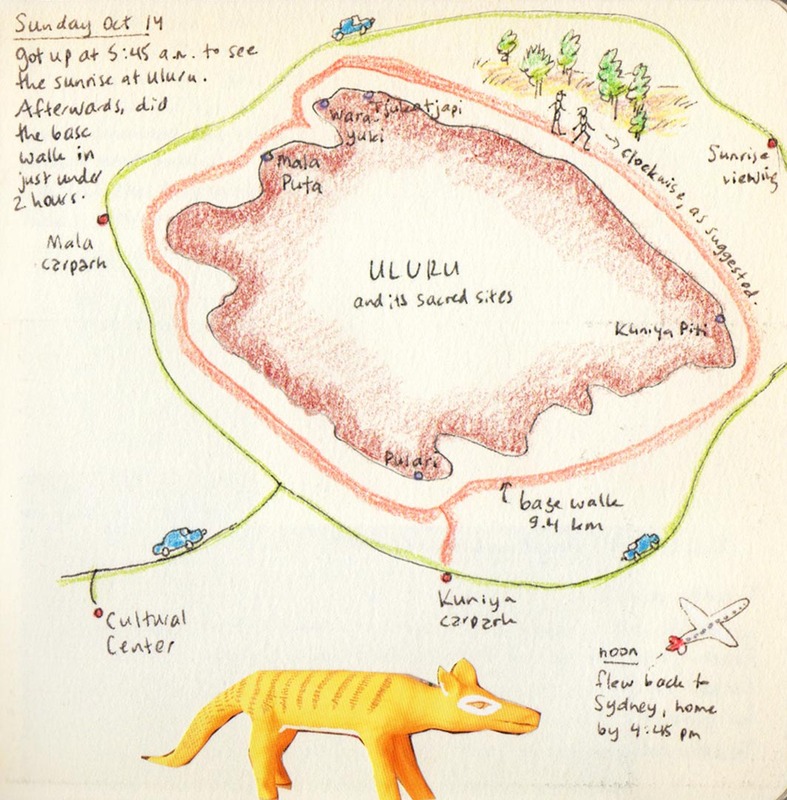 We planned on visiting Ayers Rock, now called Uluru. Where is it again? Oh, right, smack in the middle of nowhere. 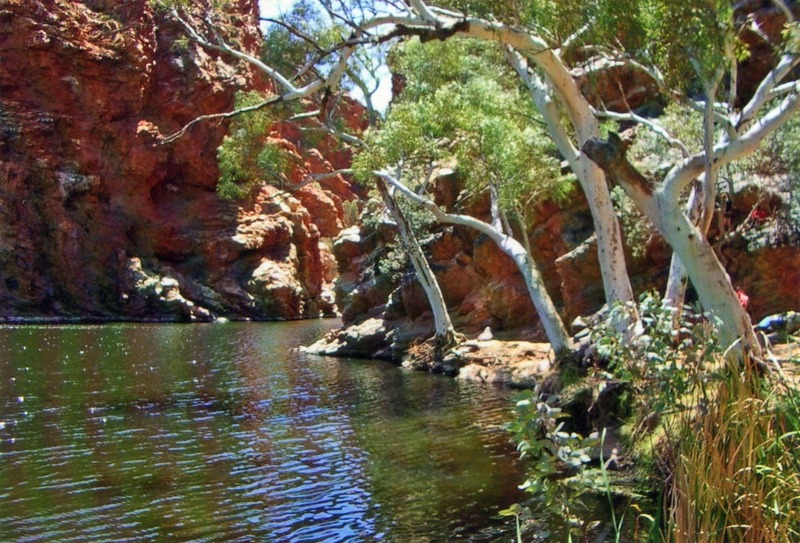 While on our way to Uluru, we visited the gorges of the West MacDonnell Range, a beautiful area near Alice Springs. 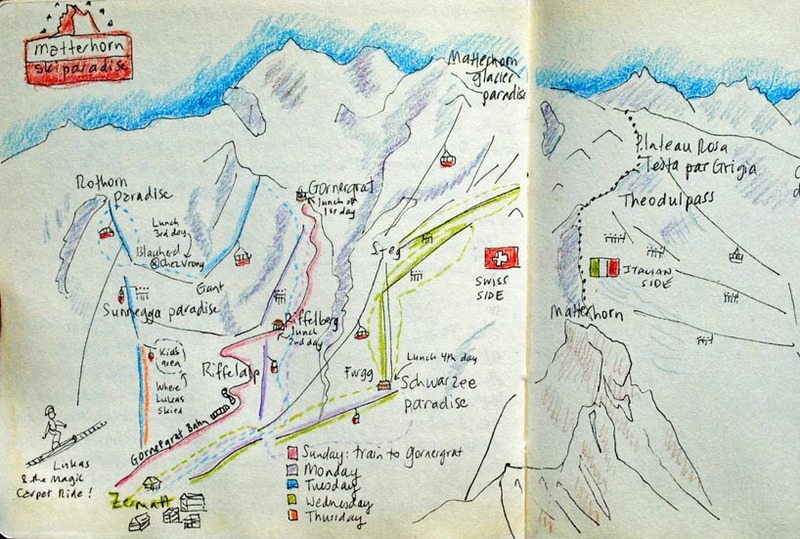 Here I tracked the routes we skied over four days in Zermatt, Switzerland in 2008. 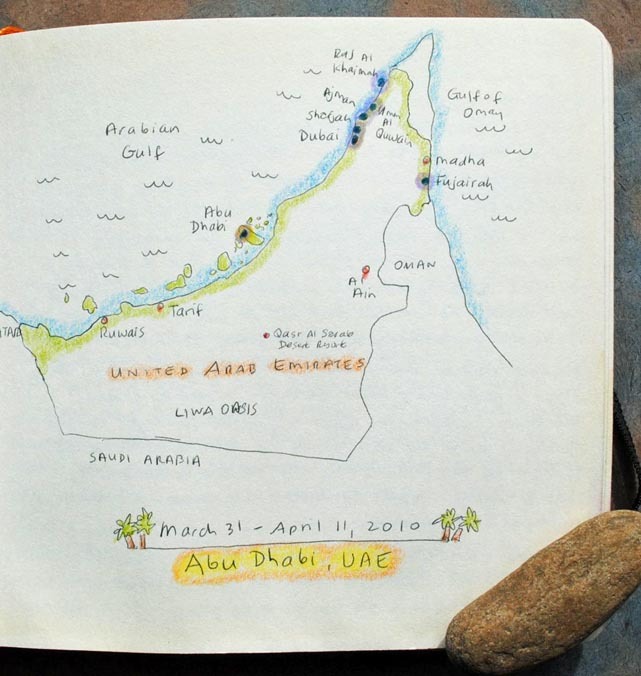 By 2010, my sister had moved to Abu Dhabi in the United Arab Emirates. Abu Where? Notice that the Persian Gulf is named the Arabian Gulf from this vantage point. Abu Dhabi is an unusual city, composed of a group of natural and manmade islands. 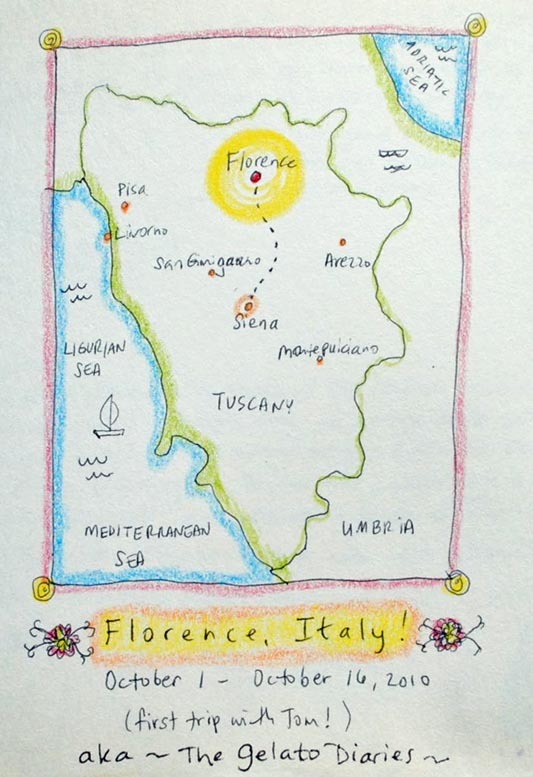 In 2010, off to Florence! I tried to keep a daily record of our epic treks around Florence. It got a bit messy! Sometimes it’s good to know when to start a new map. And to close, our drive on our most recent vacation to Vancouver and the Olympic Peninsula. May there be many more maps in the future! 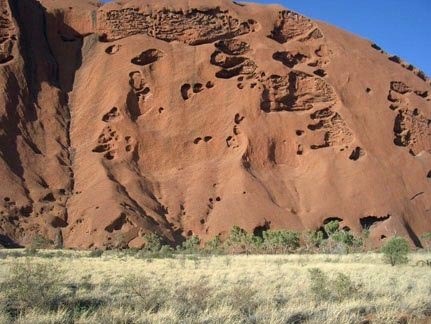 When I visited Australia a few years ago, I was excited to take a trip to Uluru, a 500-million-year-old sandstone wonder in the middle of the country. 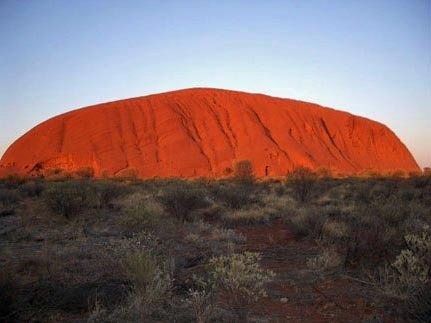 Uluru, the Aboriginal name, is also known as Ayers Rock, and is considered a sacred Aboriginal site. 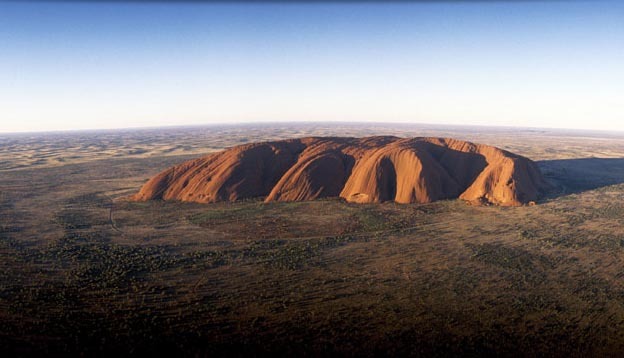 Aboriginals have populated the area for at least 30,000 years and associate the rock with ancient legends and rituals. Once you stand next to it, it’s not hard to understand why. 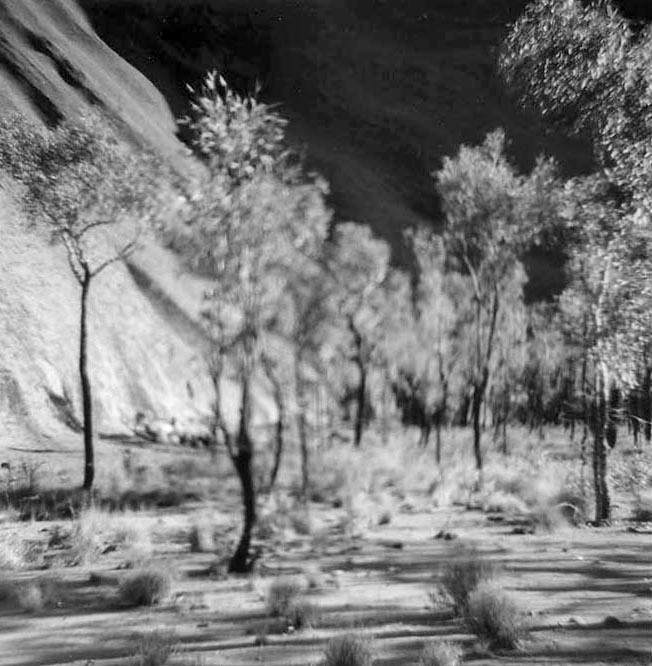 This overhead view is from the Ayers Rock Resort, which is the only place to stay in the area, offering lodgings that range from campgrounds to luxurious retreats. 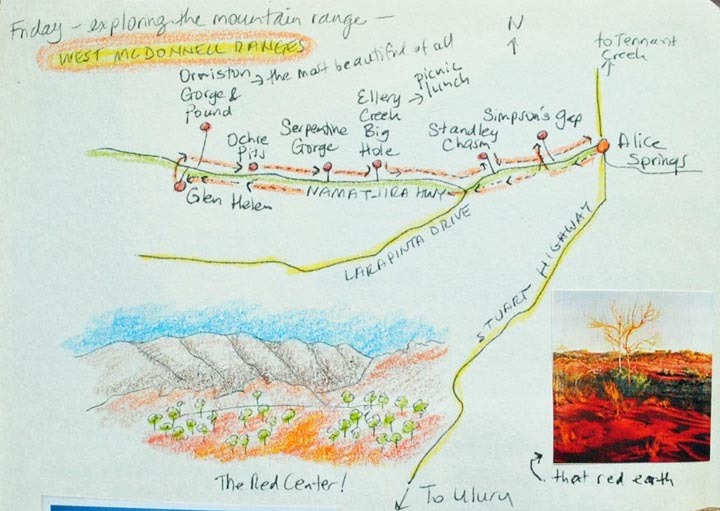 My sister and I flew from Sydney to Alice Springs, then spent a day exploring the gorges and valleys of the West MacDonnell Range. The arid landscape, with its rough terrain and unexpected watering holes, is stunning. The next day, we drove 4-1/2 hours to the Rock. Do not adjust your screen. 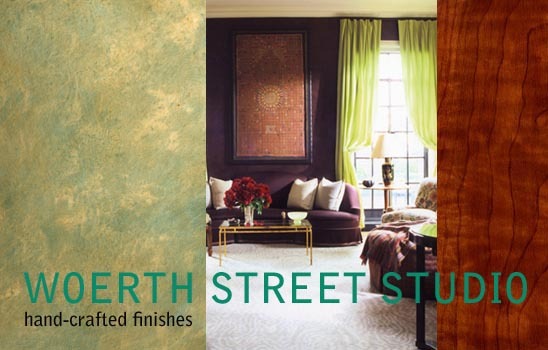 The earth is a deep sienna red. The Red Centre is the heart of Outback Australia. 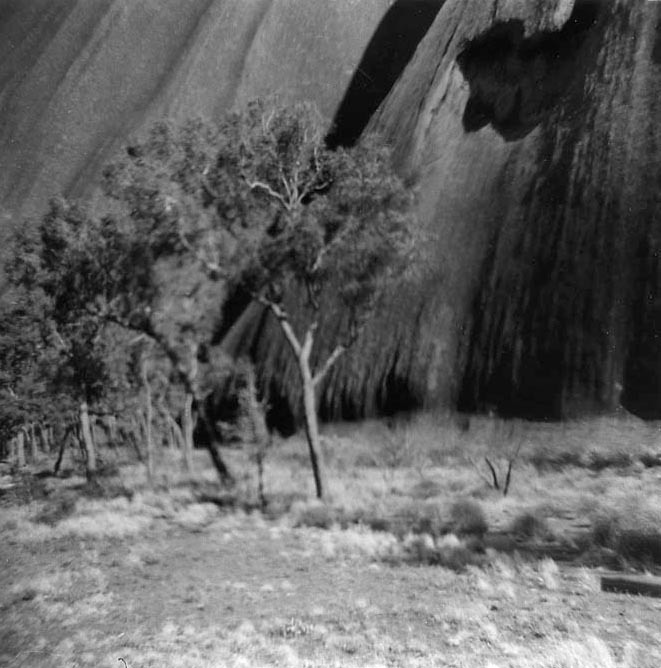 Experiencing Uluru is hard to explain. It’s overwhelming. It gave me goosebumps. It’s so deeply foreign in its massive size, its pitted, ancient surface, the myriad caves disappearing into its depths, its almost incomprehensible age. The surface has been worn smooth by millions of years of rain. It seems to have landed upon the earth from another planet, yet 90 percent of it is underground. See those trees at the base of the rock? Those are big trees, not little shrubs. The rock is almost 350 meters high. We visited the afternoon of our arrival, then returned the next morning at sunrise to view its legendary red glow. We walked the 9 km track around the base, skirting the sacred sites off limits to tourist photography, trying to take in the details of this beautiful place. 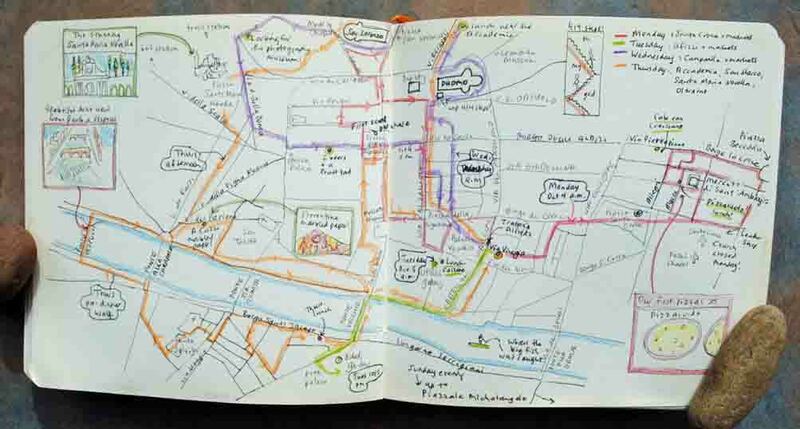 Later, I recorded our walk in my sketchbook. Tourists were few at this early hour, and we often had the track to ourselves. 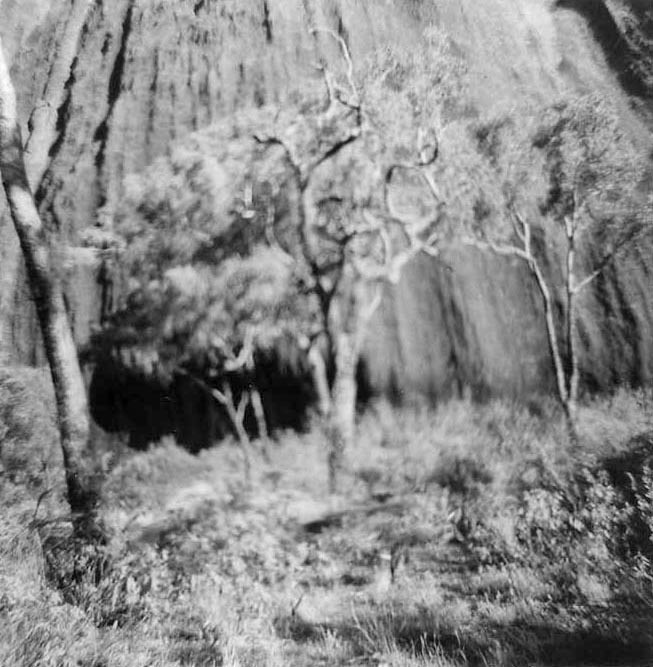 I don’t know if it was the light, the location or the ancient spirits, but some photos from that day were especially eerie. After our trek, we visited the Walkatjara Art Gallery in the Cultural Center. I had searched for authentic Aboriginal art on our trip without satisfying results, but here I found the mother lode, gorgeous work sold by the local Mutitjulu Community artists who owned the gallery. 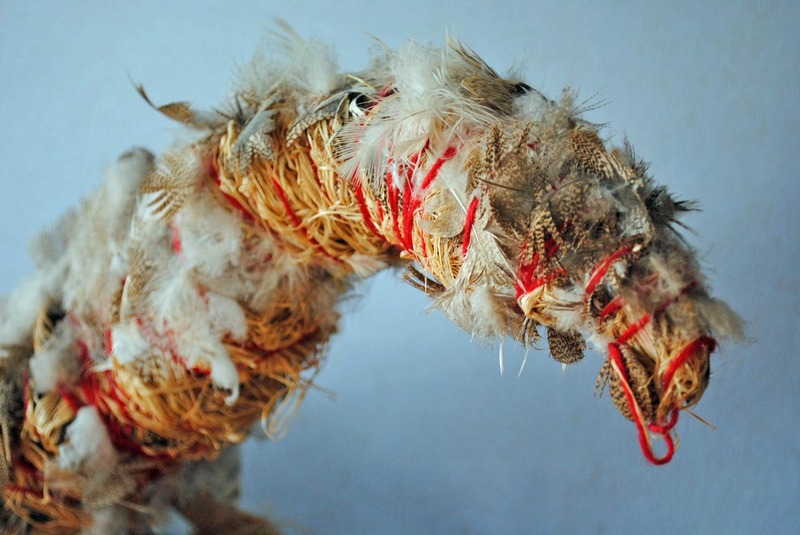 My catch: a beautiful original sculpture of a turkey, constructed out of wire, dried grasses, turkey feathers and red yarn, a fantastic abstract concoction. She’s about 40 inches long. Here’s her beautiful head. Strangely, I had no problem getting her through U.S. customs, despite the native grasses and feathers. 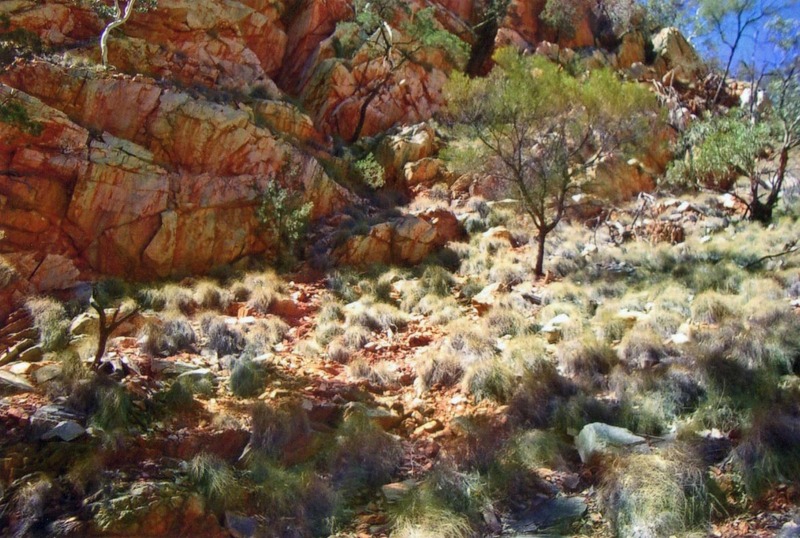 The Aboriginals have a strong tribal culture of story telling and art, their spirituality based on a close relationship between humans and the land. They believe that their ancestors rose from below the earth to form animals, bodies of water, rock formations and the sky. They do not place humans apart from or above nature. Their art is stunning. 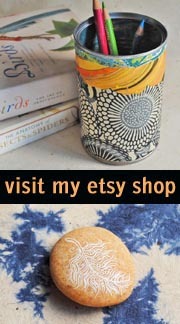 I’ll be posting more about Aboriginal art in the future. 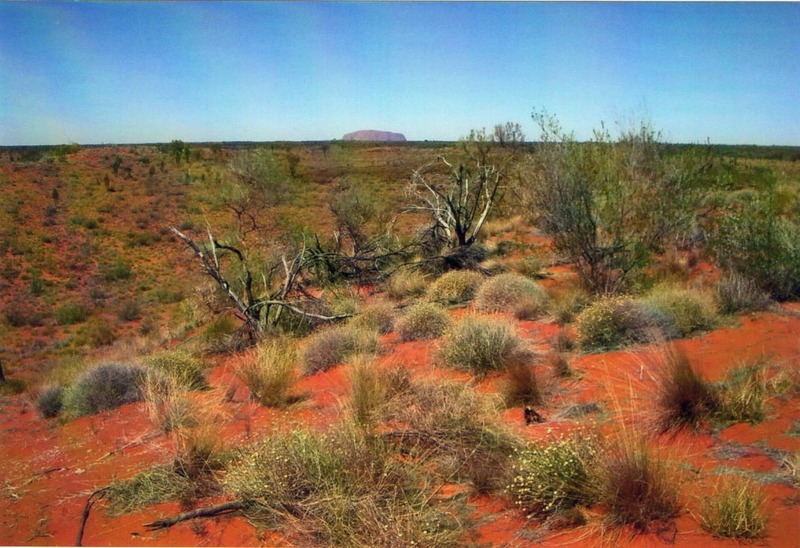 If you’d like to visit, here’s the site for Uluru-Kata Tjuta National Park, where Uluru is located. Australia has some pretty unusual animals. With their unique talents, odd names and tendency to want to kill you, it’s a whole new kind of Ark. Think I’m exaggerating? The ten most venomous snakes in the world? Australian. The most deadly spider in the country? Lives in the back yards of Sydney homes. Thinking of going for a swim? 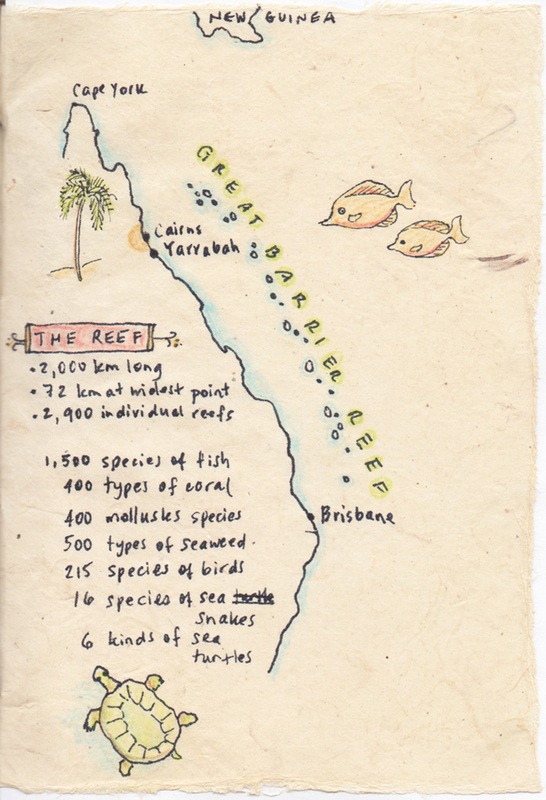 Don’t forget about the saltwater crocodiles and box jellyfish. 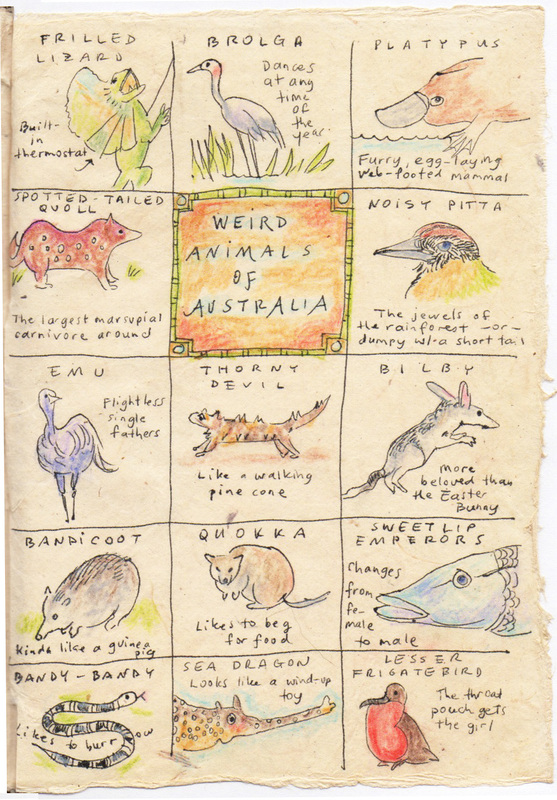 Anyway, I keep a sketchbook when I travel, and the first time I headed for those sunburnt shores, I thought it would be fun to warm up to this new destination by documenting some of the most interesting fauna. Because on a journey that’s 22 hours from door to door, there’s time! 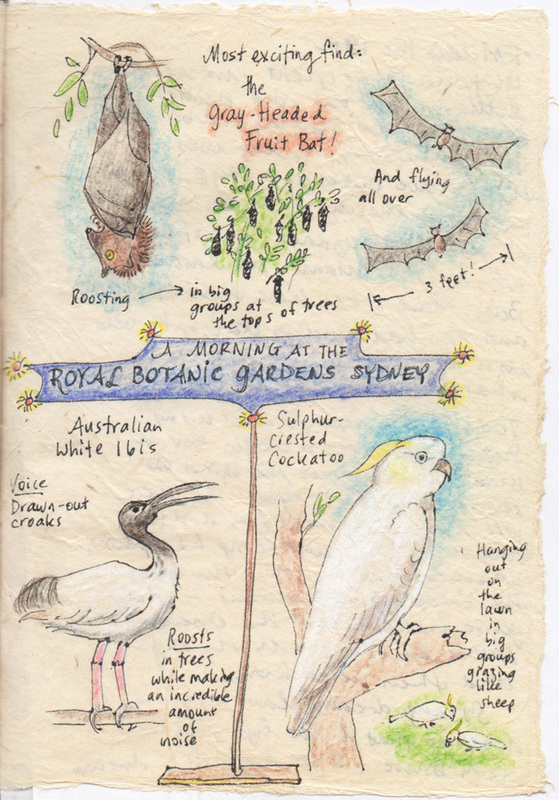 On the plus side, Australia is home to koala bears, kookaburras, and some pretty sensational fruit bats with 3-foot wingspans who hang out in Sydney’s Royal Botanic Gardens. We flew up to Cairns for more wildlife encounters (bandicoots running over our toes at an outdoor restaurant, swarms of angry bees) and spent a day on the Great Barrier Reef. I was swimming too much to draw, so this last page has a lot of white space, as they say. The reef was sensational. What a great trip.